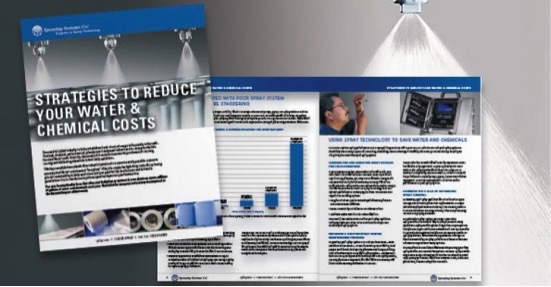 Spraying Systems Co.’s tips to help reduce water and chemical usage in critical spraying operations can help cut costs, improve product quality, and give your company a major sustainability boost. The demand for resource preservation and sustainability is unavoidable–particularly in this election season climate. Manufacturers across the market are fighting to improve sustainability, reduce their carbon footprints, and, especially, reduce their water and chemical usage. It’s a fact of life for modern manufacturing. And besides, it’s the right thing to do. But there is more to it than just that. Pursuing greater sustainability in daily operations isn’t just good for the environment; it can also offer some significant financial payback for your company in the process. Spraying Systems Co. is in a unique position to see this in action. Spraying equipment, Kouwe notes, is an often neglected part of a manufacturer’s sustainability efforts. “Often, it’s not even on their radar,” he says. And that, he says, can be a costly oversight. Unless you are carefully monitoring these systems, he says, this wear can add up to 15% above the intended flow rates, even in critical processes—basically dumping gallons of water or expensive lubricants and coatings down the drain. The cost of this waste can add up quickly. If you’ve been using the same nozzles for a few years, find out if there are newer versions available. Even if you aren’t experiencing problems, you may find new nozzle designs are available that offer greater efficiency and longer wear life. Clog-resistant designs to minimize performance problems and unscheduled downtime. Quick-connect styles to reduce maintenance time. Alternate nozzle materials to extend wear life Remember, the nozzle is the heart of your spray operation. Verifying nozzle selection is the best investment you can make in your spray system. Neglecting your spray system can cost you thousands – even hundreds of thousands – of dollars annually. Even worse, most people don’t realize that quality problems and rising operating costs are often due to using worn spray nozzles – components that can easily be replaced at relatively low cost. Spray nozzles, like any precision component, will wear with use causing flow rate to increase and performance to decline. Visual detection of nozzle wear is nearly impossible unless the wear is very significant. A quick spot check to see if nozzles are spraying often won’t reveal the problem. In addition to inspecting individual nozzles, be sure to monitor the performance of your pumps, piping, valves and filtration equipment. All of these components affect the overall performance of your spray system. Automating your spray operation will often result in liquid savings and dramatic production improvements. A simple automation project such as installing tank cleaning nozzles to eliminate manual cleaning of tanks, totes and processing vessels can pay big dividends. An automated spray system including a dedicated spray controller is another way to add precision to many operations. Spray control options range from simple systems that provide on/off control and automatic air and liquid control to sophisticated systems that provide closed-loop control of spray operations with automatic adjustments. This type of real-time monitoring of spray performance reduces the need for manual inspection of many systems. It is important to understand what benefits you may gain from spray control and evaluate the options available. Automated spray control may sound costly but most users find the investment is offset very quickly by reduced water and chemical costs, increased production, reduced scrap rate and more.